Rank A+ NP is unlocked by completing Fionn's interlude Fionn mac Cumhaill, The Hero who Defeated the Gods. 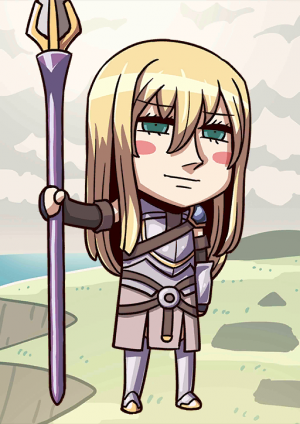 When equipped on Fionn mac Cumhaill, Increase Arts Card performance of all allies by 10% and NP damage by 10% while on the field. Descendant of the Celtic God of War, Nuadha. Leader of the Knights of Fianna. A great hero who protected the land of Erin (Ireland) by defeating an evil Divine Spirit that manipulated flames and sleep, and repelled invaders and demonic creatures using his wits and might. 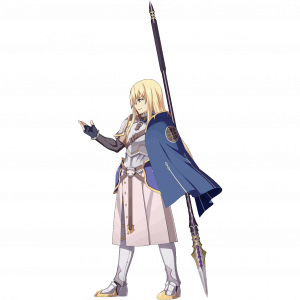 Knowledgeable and trained in magecraft, he would normally possess many abilities and Noble Phantasms. 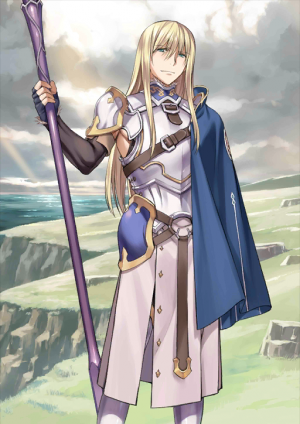 As a Lancer, his Noble Phantasms are his spear and healing power. 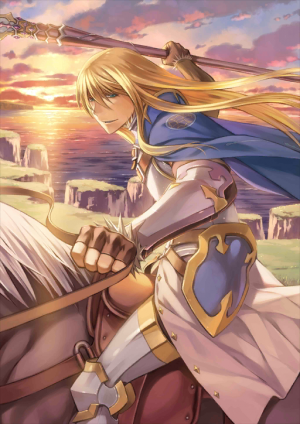 Serving the High King of Erin, he was a man who attained appropriate achievements to be admired as both the leader and the greatest knight of the glorious Knights of Fianna. He defeated the fallen Divine Spirit Aillen, a demonic boar, a horse from the underworld and finally Nuadha, the God of War himself. It has been said that he was a great man who in times of peace would go on hunting trips with his subordinates in the knight order. Though the path he'd taken as a great hero was beyond reproach, he was destined to have woman troubles. His misfortunes started when he was charmed by a pair of beautiful sisters and received a curse from them. Disaster ensued after that, he lost 7 years of his life fighting a fairy over his first wife, then the quarrel with his third wife, Grainne, ultimately led to the end of his order of knights. The problem was not with the women, the problem was with himself, but Fionn mac Cumhaill never thought of it that way. Exactly what went wrong? Even after he manifested as a Servant, he still couldn't understand. The Undefeated Violet Healing Flower. 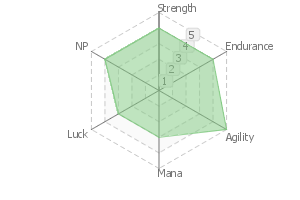 Has auto-attack functionality, and is able to nullify any mental interference. By releasing its True Name, it can control water from the God of War, Nuadha, and concentrate the stream into a single powerful blast. 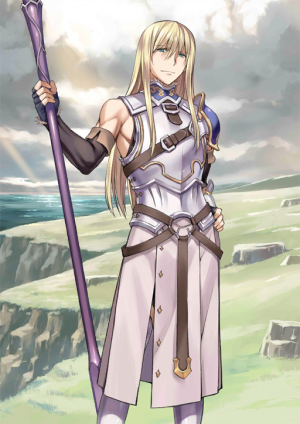 The True Name of this Noble Phantasm is the same as his sword which is often seen as the same lance that slew the being Aillen. Having served the king of Ireland during his former life, he has no reservations about working under someone as a Servant. He desires to be a hero that serves the people. Also, perhaps because he materializes with a youthful appearance, his mental age is also younger than his older days. (He has retained all his memories until his later years). A descendant of the Celtic War God Nuada and the leader of the glorious Knights of Fianna. A great hero that established many valorous deeds - such as saving the capital by defeating an wicked Divine Spirit that manipulated flames and sleep, or defeating invaders and monsters as the guardian of Erin (Ireland). 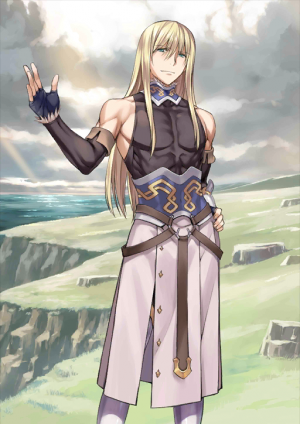 Having mastered magecraft and wisdom, originally he would be endowed with many abilities and Noble Phantasms. 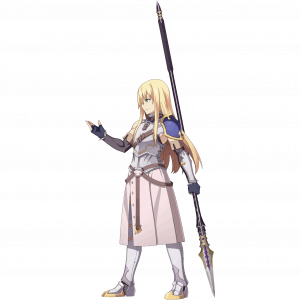 As a Lancer, he treats the spear and healing abilities as his Noble Phantasm. Serving the High King of Erinn, he was a man who attained appropriate achievements to be celebrated as both the leader and the greatest knight in the glorious Knights of Fianna. He defeated in battle the fallen Divine Spirit Aillen, the magic boar, the horse of the underworld and in the end even his divine ancestor, the War God Nuadha. It has been said that he was a magnanimous man who, in times of peace, spent his days quietly while carrying out hunts and the likes with his subordinates in the knight order. He underwent an impeccable journey as a great hero, but also had a fate of trouble with women. His first hardship was becoming charmed by a beautiful sisters and receiving a curse. His misfortune continued afterwards; seven years were stolen from him by a conflict with a fairy over his first wife and the dispute concerning his third wife, Grainne, caused the glorious knight order to collapse. Maybe it was not that there was a problem with the women, but he himself that was at fault-- until the very end, Fionn mac Cumhaill never came to think like this. "What exactly went wrong?" Even now, after becoming a Heroic Spirit and manifesting as a Servant, he still does not understand. It possesses effects such as autonomous attack functions and negation of mental interference. If the True Name is released, it fires a single attack that is accompanied by a violent torrent of "water" that the War God Nuadha administers. The True Name comes from a inscription about his supposed favorite sword. Said sword is every now and then regarded in the same light as a spear, and it was assimilated with the spear that killed the Divine Spear Aillen upon being established as a Noble Phantasm. Since he also worked for the sake of the High King of Ireland while alive, he has no reluctance about operating under somebody as a Servant. As a hero, he desires to work for the sake of the people. In addition, maybe because he has manifested in a youthful appearance, the orientation of his mentality is "younger" than that of his last years (but still possesses the memories all the way until his last years). This page was last modified on 1 January 2019, at 21:29.